TACLOBAN CITY-A town in Eastern Samar was rendered isolated after a landslide due to tropical depression ‘Samuel’ hit in the village that served as its entry point to a nearby town. Compounding the misery of the residents of Jipapad town was the relief food supplies that the municipal government prepared at its municipal building were soaked by rain water after the town was hit by Samuel on Tuesday(Nov.20). Creonto Mato, town’s disaster risk reduction and management officer, said that the flooding spawned by Samuel was the ‘worst’ to hit the town since 2006. “We are asking for food relief. The people are now hungry. Its ok if it’s only the clothes that were wet as these could be dried. We really need foods. We don’t have food supplies for our people as our town was rendered isolated after a landslide occurred in Barangay Roxas,” Mato said. Brgy. Roxas is the town’s entry point in going to the nearby town of Arteche, which was also hit by a massive flooding. He also said a landslide reportedly occurred in Brgy.Catumsan, Arteche and is just adjacent to Brgy.Roxas. Mato also said that aside from food supplies, the town also immediately need medicines as various diseases may affect its residents due to flooding. 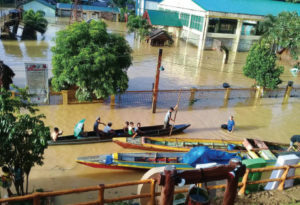 He added that practically all the 13 barangays of the town, populated with 2,556 families or more than 15,500 people, experienced flooding that even two-storey houses were submerged by rain water. He said Jipapad easily experienced massive flooding whenever there is a continuous rains as it served as a ‘catch basin’ from water coming from Oras and Binuwangan Rivers. “We really need help. Our power and communication lines are still down,” Mato said. He added that flood water have receded on several villages of the town but there are still areas in the town where flood water remain. 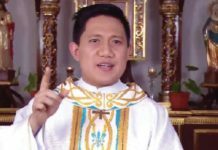 The Leyte Samar Daily Express was able to reach Mato as he happened to be in Oras town when he was sought for a phone interview on the situation of their town, 155 kms away from the provincial capitol of Borongan City. According to him, he learned on the situation of their town through radio messages from members of the town’s Kabalikat Civicom. He said that based on the initial assessment of their Municipal Disaster Risk Reduction and Management Office, about 35 houses were washed out due to Samuel.